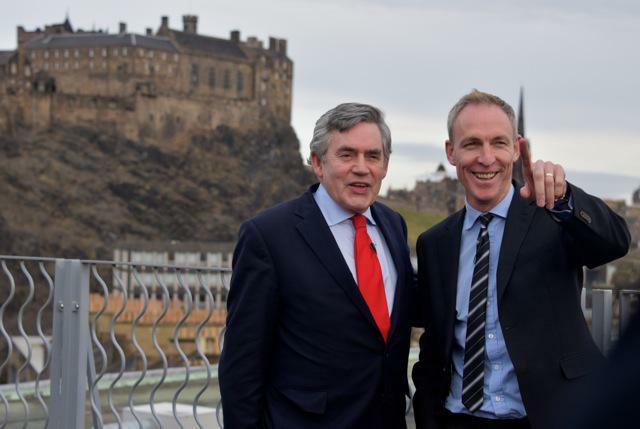 Scottish Labour leader Jim Murphy spoke in Edinburgh yesterday alongside Gordon Brown. He set out the party’s different vision of Home Rule. Come the General Election, we will, of course stand in solidarity, with other Labour candidates, from London to Liverpool, Cardiff to Newcastle. To deliver the change that many people across the UK are determined to see. Standing in every part of Britain means at the election we can offer the change the Nationalists never can. The most important consideration for many Scottish voters when they look at their ballot paper in May will be how to best achieve change and how to get rid of the Tories. On Election Day people will increasingly know that if the Tories are the largest party then they will get the chance to form the Government. Only Labour can offer the change that people want to see: the ability with Home Rule to make distinctively Scottish decisions. And the power to redistribute the wealth of the UK to invest in our NHS and to give young people more job opportunities. So in fighting this UK General Election, as a Scottish Party, we know that our coalition with Labour across the UK gives us an unanswerable advantage over the nationalists. While we share with the rest of the UK Labour Party a determination to defeat David Cameron, Scottish Labour MPs and candidates will stand not just on our own distinctive policies but a separate Scottish Labour Manifesto for change, written in Scotland, to deliver the change Scotland needs. Over the next few weeks we will continue to set out the big pledges within that manifesto. I began this process with our pledge on the NHS: using the proceeds of a Mansion Tax on properties worth £2m across the UK to invest in the Scottish NHS and to fund one thousand more nurses. A change only Scottish Labour can deliver. The fairness of the policy means that it’s something that the Tories wouldn’t introduce, and the UK redistribution of it means it’s something the SNP couldn’t introduce. In the weeks since I made that pledge we have seen many Accident and Emergency Units across Scotland in crisis, operations cancelled and waiting time targets missed. Our NHS desperately needs this additional funding, investment that comes from the redistribution of wealth around the United Kingdom. Only a vote for Scottish Labour can deliver this funding because only Labour is standing in every part of Britain on a manifesto commitment of a Mansion Tax and for the retention of the Barnett formula which can deliver that new investment. The nationalist proposition of Scottish only taxes for Scottish spending means losing the guarantee of additional funding for the NHS through the Barnett Formula. But it also means losing the security of the additional funding of the UK pension and benefits system. Today I want to make the choice for Scots clearer. I want to set out more of our manifesto, how we will go further than The Vow on welfare, offering more change. And I want to announce Scottish Labour’s second General Election pledge. We won’t just deliver The Vow, I want to confirm today that we will go further. Delivering The Vow is an important point but not an end point for Scottish Labour. The remarkable thing about Smith was that a consensus could be agreed between 5 parties. But a Labour approach to powers, and to the use of powers, will reflect our different values and different ambitions for Scotland. Our different vision of Home Rule. We have different values from the Tories on welfare and different values from the nationalists on redistribution. The Tories would not give Scotland the freedom on welfare we seek, while the SNP would not protect the fundamental guarantees of the UK wide welfare state we need. Only Scottish Labour can and will deliver both. The Smith Agreement gives Scotland significant new spending and tax powers. However, a Scottish Labour party would ensure that the Parliament also has more power to spend that money on tackling poverty and unemployment. If in Scotland we want to do more we will have the ability to raise more money. Guaranteeing, on top of the minimum of the UK benefits system that the Scottish Parliament will have the final say on benefit rates meaning that there can never again be a bedroom tax in Scotland. Ensuring that the Scottish Parliament has the power to create new benefits, in addition to the guarantees of the UK benefits and pensions system. Extending powers over the incentives and support to work in the benefits system, with particular focus on ensuring all young people get the job or training they need to unlock the opportunities they deserve. Full devolution of Housing Benefit, not only ending the bedroom tax, but providing £1.8 billion pounds of investment in housing in Scotland. And devolving welfare not just to Holyrood but to local communities, starting with the work programme. Ensuring that back-to-work support matches the needs of local people and the demands of the local economy. and from benefit cuts caused by a fall in Scottish funding due to, for example, the collapse in the oil price, the inevitable consequence of the nationalists plans for full fiscal autonomy. While the Tories cut welfare and the SNP cut colleges, we would bring them together with a positive vision for tackling the low skills, numeracy and literacy problems that hold back adults trapped in long term unemployment. So Scottish Labour will stand in May on this pledge: We will deliver on The Vow and offer more on The Vow. The security of the UK pension and benefits system plus the power for Scotland to top up UK benefits, and create new benefits of our own, because the Scottish Parliament will have the financial freedom to support this.